As winter gives way to spring in the Arctic, the region’s lid of floating sea ice is shriveling much more sharply than normal. According to the National Snow and Ice Data Center’s latest monthly update, published April 3, Arctic sea ice reached its maximum extent on March 13, which marked the end of the winter season. Since then, warming spring temperatures have caused the ice to shrink — and lately, the shrinkage has been record-setting. Late-March ice losses in the Bering Sea between Russia and Alaska have been particularly steep, in turn driving the Arctic’s overall ice extent to a record low level on April 1, according to the NSIDC. With that in mind, I created the animation above to show just how dramatic the loss of ice in the Bering Sea has been. The labelled image in the animation shows the extent of sea ice coverage in early April of 2013, as seen by NASA’s Terra satellite. At that time, ice coverage in the Bering Sea was was slightly above normal. In the second image, acquired by the Suomi NPP satellite on March 26th of this year, note the huge expanses of open water. The copious sea ice seen in 2013 is largely absent. To help you fully appreciate the scale of the losses, consider that the distance from left to right across the middle of the scene totals 1,000 miles. The graph above puts Arctic-wide losses in perspective. As the orange line shows, the drop in sea ice after it reached its maximum extent in mid-March has been vertiginous. Compare that to the dashed green line, which shows how conditions unfolded in 2012. That year, Arctic sea ice extent went on to set an all time low. Does this year’s early drop portend a new record low this coming September? Only time will tell. But here’s something to keep in mind: Ice reflects sunlight back into space, helping to keep temperatures down. By contrast, large open swaths of relatively dark sea water absorb solar energy and warm as a result. This hastens the shrinkage of sea ice. What’s happening now is a significant from what was happening during the long winter. “Moderation marked the 2018 to 2019 winter,” according to the NSIDC. Air temperatures at roughly 2,500 feet above sea level were actually above average for most of the region. That was also true for the month of March itself. Even so, Arctic sea ice extent for March continued a long-term decline of 16,100 square miles per year. On average, that means an area of ice nearly twice as large as New Jersey has disappeared each March since record-keeping began in 1979. Thanks to declines in sea ice extent, the season of open water in the Arctic has been getting longer. This, in turn, means snow has less and less time to accumulate on the ice. Less snow cover can slow down the growth of sea ice in fall and winter, and hasten its demise during the warmer weather of spring and summer. This is another way that retreating sea ice, driven by our emissions of climate-warming greenhouse gases, can lead to a self-reinforcing process. Early ice loss has been noticable for the last 4 or 5 years. While 2012 stands as a record, the year did not start with similar ice loss. 2012 suffered a sharp decline from April through to September. A combination of factors that prevailed in 2012 and an early ice loss as seen in the Barent see would see the 2012 record low surpassed. I presume it would depend on whether we see storms in the arctic as we did in 2012. 70% of greenhouse gas output is by China, India and Underdeveloped countries, much of from their efforts to electrify their rural areas. Their output is actually rising, while the output of the Western nations is decreasing. Rural India and Sub-Saharan Africa cannot take advantage of 300 foot windmills or Thorium reactors. No money, no grid, no tech support, etc. Which leaves highly efficient solar coupled with highly effective battery storage. Low cost, low tech and suitable to those cultures and their energy needs. I wonder how far we are from that goal, because the global greenhouse output problem will not significantly improve until that happens. And what we are able to do about the greenhouse gas already in the atmosphere, if much of anything at all, is a completely different problem. 90% of statististics are made up! Which countries were you including with China and India, they make up only 32.33% of total emissions as of 2014. So that would make you short of enough countries to make up the extra 36.7 % of emissions. Of course per capita, the US consumes 16.44 tonnes, Canada 15.52 tonnes per capita, Germany 9.7 tonnes per capita and the UK 5.93 tonnes per capita. China and India on the other hand stand at 7.36 tonnes per capita and 1.84 tonnes per capita respctively. US emissions were estimated to have risen by 2.5% in 2018. N’cest pas un decrease! Per capita production is directly correlated with industrialization and wealth. As you can see, even with per capita consumption in mind the U.S. produces just 14.3% of global CO2, and is on a down trend. The center of gravity of the problem in China, India and Underdeveloped countries. Good points. Per capita figures have yet to catch up with the U.S., and may not catch up if the pace of alternative energy production increases, as it should. 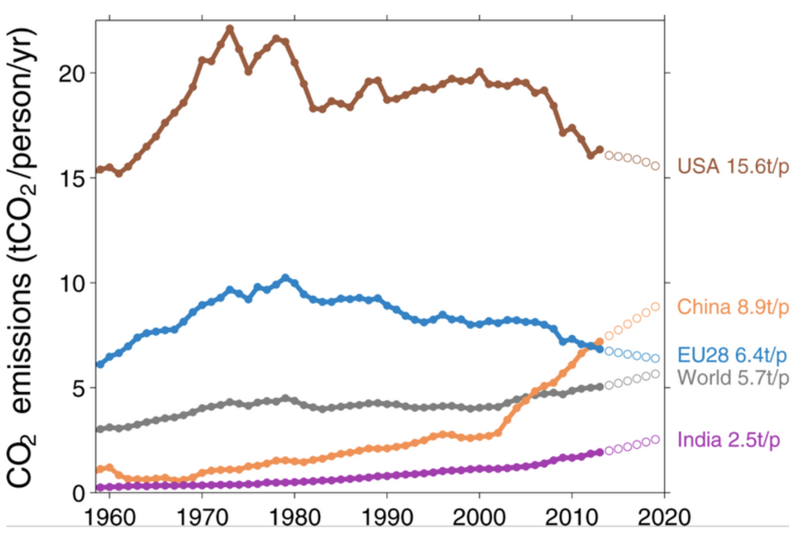 Trends, not current emissions. And trends can always change. One can hope, but for some very solid scientific reasons regarding wind, photovoltaic cell and battery technology bending the trends could be very difficult going forward.